Truck Driver Crazy Road 2. It continues the awesome 3D truck driving simulation of the series and features 2 game modes: Delivery and Parking. In Delivery, your truck will be given some shipment that you must deliver to a specific location as quickly as possible without harming the package. In Parking Mode, you must learn to park your car at the correct place. And try to park the car before the timer runs out without damaging the vehicle, the properties, or other cars on the way. Get ready to drive some big trucks in the 2nd entry to the awesome truck driving series. Prepare yourself for some off-road madness in Truck Driver Crazy Road 2! Complete all 10 levels to unlock the next destination! Good luck! 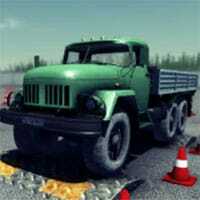 Truck Driver Crazy Road 2 is a free online driving game on Round Games.